As the UK is a major Danish export market, a hard Brexit could trigger a significant decrease in Danish export of food and agricultural products. 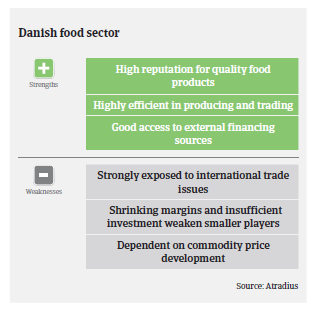 The Danish agro-industrial sector accounts for almost 25% of Danish commodity exports, with more than two thirds of Danish food production destined for export. China has joined Germany, Sweden and the UK as Denmark’s most important food export markets, and sales increases in recent years have mainly been driven by demand from emerging markets. The most important export commodities are pigs and pig meat (19%), fish & seafood products (15%), and milk & dairy products (12%). In general, large Danish food businesses are active globally and performing well, while smaller manufacturing and trading companies supply the domestic market and/or export to close markets like Germany, UK, Sweden and Eastern Europe. Small food producers and wholesalers generally face tough competition and low profit margins. 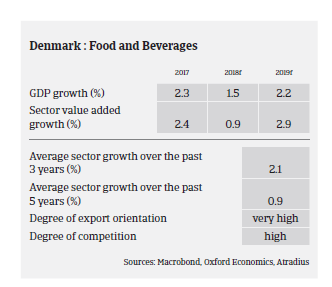 With its high dependence on exports, free trade and open markets are crucial for the Danish food industry. Current issues in international trade like the Russian import ban and the ongoing US-China trade conflict have a negative impact on Danish food exports. A hard “Brexit” would have serious impacts on the industry, as the UK is one of the most important export markets. It is estimated that a hard Brexit could trigger a significant decrease in Danish export of food and agricultural products to Britain. Turnover development in the traditional food wholesale and retail segment is rather flat. The domestic market is characterised by excess capacity, fierce competition and price sensitive consumers, putting pressure on retailers´already thin profit margins. The discount segment accounts for more than 40% of the market. Domestic sales of food via retail amounts to EUR 2,300 per capita or approximately 10% of disposable income, which is quite low compared to other European countries. Benefiting from changing consumer habits is catering & food service, which has experienced strong growth in recent years, diverting demand away from traditional grocery trade. Online sales of food currently accounts for just 3% of total sales, but is increasing approximately 15% annualy. Apart from the farming segment and some parts of vegetable production, external financing, including bank loans, is generally quite accessible for food businesses. On average, payments in the Danish food sector take between 30 and 60 days, and the payment experience over the past two years has been good. However, some large players continue to push the supply chain on both price and longer payment terms, adding cash flow challenges to mainly smaller food businesses. The outcome of pricing negotiations, mainly between retailers and smaller food producers, will to a large extent determine the future non-payment and insolvency development in this part of the sector. Payment delays have increased year-on-year in 2018, although from a low level, and are expected to level off in 2019. The insolvency level in the industry is low and the outlook for 2019 is stable. In combination with high gearing and deteriorating prices the summer 2018 draught has led to higher insolvencies among Danish farmers, and this trend is expected to continue in the coming months. However, we expect this to have only marginal effects on other parts of the industry. 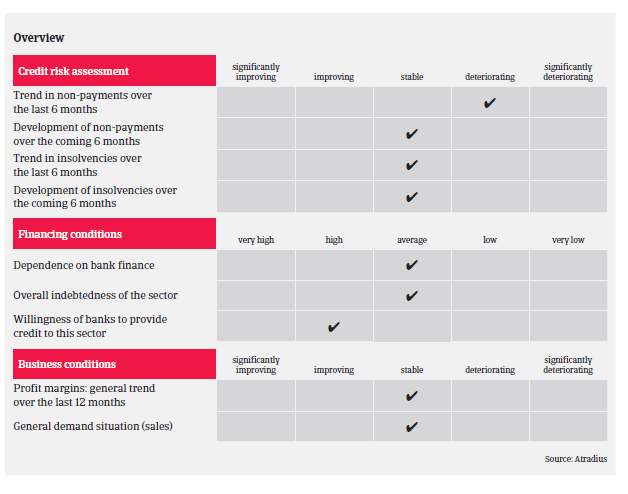 For the time being our underwriting approach remains open across all subsectors. However, in the domestic retail businesses fierce competition with price wars have a negative impact on earnings and business stability, mainly for smaller companies. 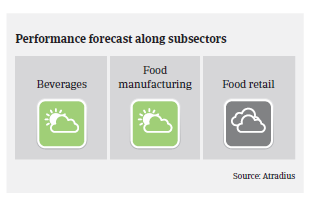 As profit margins are generally low in the food sector, businesses, especially smaller players, are susceptible to sudden market shocks. Therefore we closely monitor the impact of Brexit on food businesses dependent on exports to the UK (mainly seafood, meat and dairy businesses). We also monitor the further developments in the Sino-US trade dispute and assess any negative impact on Danish food exporters. The survey’s biggest negative change in the proportion of uncollectable receivables was recorded in Denmark; up from 1.3% in 2017 to 1.8% in 2018. There is pressure on the profits of turbine manufacturers and their suppliers along the value chain, and further consolidation seems to be likely.